In Plain Hunt each bell “hunts” down to the front, strikes two blows in leads (ringing before all the other bells), hunts out to the back, and strikes two blows at the back. Each bell starts at a different point in this cycle, depending on its initial position. The bell in “leads” (= the first position) starts by hunting out; it must, since it can’t hunt in to the front, it’s already there. The other odd bells (the ones in 3rds, 5ths, etc.) also begin by hunting out. Even bells (in 2nds, 4ths, etc.) begin by hunting in. If there are an odd number of bells, the last bell has no one to trade places with initially so it strikes one more blow in the same position before hunting in. Understanding how the audio relates to the diagram and chart: The top line of the diagram (with the dark grey background) shows the last backstroke rounds, with black for the treble bell, blue for the 2, red for the 3, and green for the 4. 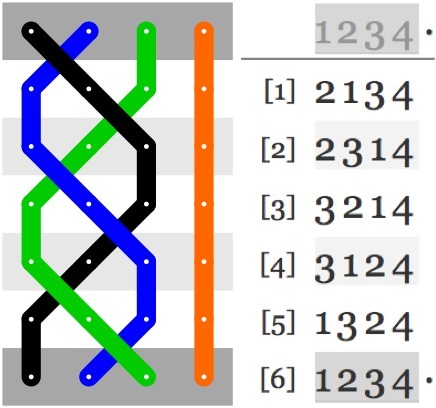 The audio file begins at line 1, with the bells in sequence 2143 (E-F-C-D) at handstroke, then 2413 (E-C-F-D) at backstroke (grey background in diagram), and so forth until at the eighth row they are back in rounds (1234) and the audio ends. You may notice a pause every so often with no bell striking; this is the handstroke pause that is traditionally left before the first strike of every handstroke. The handstroke pause helps the ringers keep track of where they are, and gives the ringing a nice sound. Four bells are “in the hunt”, and a fifth bell rings behind at each stroke (“tenor behind”). Having a tenor behind helps keep all the other bells steady; the tenor can concentrate on ringing at an even pace, and the other bells can use it as a constant landmark as they move about. Four bells are “in the hunt”, and a fifth and a sixth bell ring behind at each stroke (“two covers”). Having two covers helps keep all the other bells steady; the two covers can concentrate on ringing at a steady pace and keeping the proper interval between them, so the other bells can more easily tell when to strike. The middle four bells (2-3-4-5) are “in the hunt”, with the treble ringing ahead and the tenor behind at each stroke. This gives the middle four some mental exercise, since they are ringing plain hunt on four but not on the usual front four. The treble ahead and tenor behind frame the working bells, and give the treble focused practice on leading. Five bells are “in the hunt”, and a sixth bell rings behind at each stroke (“tenor behind”). Having a tenor behind helps keep all the other bells steady; the tenor can concentrate on ringing at an even pace, and the other bells can use it as a constant landmark as they move about. All six bells are “in the hunt”. We use this in teaching new ringers to hunt, after they have mastered Making Places which is essentially Plain Hunt on Two. In this version of Plain Hunt, each bell rings four strokes rather than two at leads and at the back, and two strokes at every place in between. It is particularly indicated for bands that are struggling to hunt in and out cleanly, and sounds better than Plain Hunt on Three.